1 HP DIGITAL 240V to 415V 3 PHASE INVERTER CONVERTER LATHE MILL DRILL. DIGITAL INVERTERS 240 V OUT. DIGITAL 240 TO 415 INVERTERS. 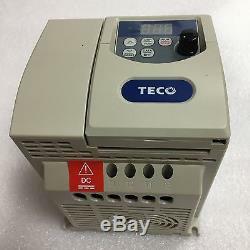 TECO EV 3HP 240V Single to 3 Phase Inverter Converter for Lathe Mill Drill SAW. The old fashioned STATIC and ROTARY phase converters are the most basic type of converters, they are not much good at all with the STATIC being large and heavy as per the right hand picture above and this STATIC type will often have problems running modern motors and when they do run them at all they are not at all smooth and you will have a loss of power and our customers have often burnt out small motors using a STATIC type converter! Keep well clear of them! GO DIGITAL - It's the only way to go! We combine the BEST PRICES with the BEST CUSTOMER SERVICE EVER to offer you user friendly POWER CONVERSION and SPEED CONTROL solutions. We can assist you in powering any 3 PHASE MACHINE from a tiny 90 Watt motor on a clockmakers lathe right up to an entire workshop with 20+ people working machines. You are looking at a 3 HP TECO single to three phase inverter unit, for any other size please see our. It is designed to run a three phase motor from a single phase supply it also lets you control the speed from 1 RPM to twice the motors normal speed either by using a remote POT or the control on the unit, this is fantastic if you have the unit connected to say a lathe or milling machine as you have exact control over the machines speed , please be careful though because you could exceed the maximum safe speed for your machine, the max and min settings are programmable, you can also reverse the motor at the touch of a button. It features a SOFT START to start up the motor in a preset time and this reduces the shock load on a machines belts/gearboxes and also reduces the power surge on the mains that can blow fuses without the SOFT START, the motor stop time can also be programmed to stop a chuck within a few seconds if required using the braking function. Sizes from ¼ HP up to 3 HP. User Friendly Inverter - Easy to use. This unit will work with most types of motor but the motor has to be a dual voltage type in order to run at FULL POWER. You can also look at the motor connections to check compatibility, most motors have the 6 terminal arrangement as shown below. Here the motor is shown wired in STAR mode, in this mode it can be run on 415 Volts 3 phase, to enable the motor to be used with this range of inverters you need to set the motor in DELTA mode as shown below. Not all motors have this configuration of terminals for example BROOK'S motors as oftern found on small lathes like the Myford etc will have a 3 terminal arrangement with terminals A, B and C each with one wire connecting to the motor and an N terminal with 3 wires on it, this again is a DUAL VOLTAGE motor compatable with this inverter. This unit will work with motors up to 3 HP power output and the unit can give you a 150% overload for 60 seconds for starting the motor or short heavy power requirements. 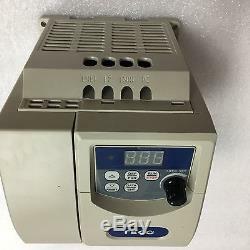 We do have smaller and bigger units and also some 240V single phase input to 415V 3 phase output units for NON DUAL VOLTAGE motors so please check out my other items. The complete guide to running your 3 phase machines on a single phase 240V supply by Drives Direct(Inverters) LTD.
Often getting a three phase supply installed from the national grid can be an expensive and time consuming task and it can lead to other complications as well, when you get a quotation its likely to be prohibitively expensive and even if you were to go down that route the quote will normally only cover groundwork's from the nearest 3 phase cable to the boundary of your property, you are then responsible for the excavation and making good of the trench on your side of the property, it can take months before they start the work and then when you get your supply the chances are the commercial rate tariff they offer you will be far more expensive than a domestic tariff and often there will be a daily standing charge to be paid even if you use no 3 phase at all that day! Also if you are in a domestic situation you can end up with the council contacting you to find out why you have had an industrial supply fitted to say your home garage and seeing if they can now charge you for business rates then the council get involved and start asking for a planning application for change of use to a business! STAR (415V) MODE DELTA (220V) MODE If you have a machine that is NOT fitted with a DUAL VOLTAGE motor then you can still use inverter technology but as the motor requires 415V 3 phase then you will require a DUAL STAGE inverter, this is very similar to the 240V inverter product in that it changes your 220V single phase in to three phase BUT it also boost's the voltage up from 220V to 415V, On the downside of this because the DUAL STAGE inverters are twice as complex as the SINGLE STAGE 220V output units and working at higher voltages they tend to be far more expensive than the BASIC 240V versions and if its practical to change the motor to a modern DUAL VOLTAGE type then often you can get a package of motor and inverter for less than the cost of the DUAL STAGE 415V output inverter, where these DUAL STAGE inverters often prove most useful are in cases where its not practical for whatever reason to change the motor for example a power feed motor where the case of the motor is part of the machines casting, Both of these inverter options will offer you other benefits as well, they have a built in SOFT START, this function will allow you to set the time it takes for the motor to reach full speed after switch on, this is good for your machine as it reduces the shock loading on the machines power train at start-up as well as reducing the surge on your incoming supply, inverters also offer you FULL SPEED CONTROL of your motor, this is very useful on some machine applications as where you would normally need to change belts to alter the chuck speed now you can simply turn a knob and the inverter will change the speed for you, these inverters also feature a brake function to slow down the motor after you stop it, this is great for say woodwork machines where having this function enabled will allow the machine to comply with HSE regulations by stopping the blade within the 10 seconds as required, If you are looking to power a whole workshop or if you machines contain electronics like welders or CNC machines then you need to look at either the modern DIGITAL PHASE CONVERTER option or the old fashioned ROTARY PHASE CONVERTER for those on a tight budget with a less demanding application. For small hobby applications on a tight budget this may well be acceptable as the converter will often be at the lower end of the power range for converters so the constant power waste will be smaller AND its often not a problem for a hobby user to turn the converter off when its not in use and then switch it on again when they need to use one of the machines, in this case the machine being powered will often be making more noise than the converter so the noise aspect of the rotary converter will not be a problem. Rotary converters are NOT recommended for applications requiring 3 phase power 24 hours a day. For any demanding applications where the quality of the power is important such as CNC machines, precision equipment or equipment with electronics or for industrial use where the unit may be switched on 8 hours a day or more running a workshop for example or on an application that requires a 24 hour 3 phase supply for example with ground source heating systems, pool filtration, HVAC systems, water pumping, passenger lifts etc then you should look at our DIGITAL PHASE CONVERTER systems, these DIGITAL converters have perfect phase output voltage and phase angle and they run without any pilot motor so they are very economical on power and they produce very little noise and are rated for 24/7 operation, Types of phase converter :- DIGITAL PHASE CONVERTERS. These offer all the functions of the basic unit BUT they are what's known as an ADVANCED VECTOR INVERTER, this has the advantage of allowing control of your motors speed without loosing power, on the basic inverter the power of the motor will reduce as you reduce the speed but with the vector version this does not happen and that's fantastic for application like lathes etc where you can do away with the belt step change and use one of these units to give speed control, the advanced unit is also able to link up to the advanced pushbutton remote station as well as the basic remote control box, these ADVANCED INVERTERS can do a whole load more than described here like interfacing to a computer for remote control on applications like CNC machines and these are available in power levels from ½ HP up to 5HP and they are also available with a 240V single phase input and a 415V 3 phase output. This range of converters offer the same functions as the basic and advanced units BUT these give out a 415 Volts 3 phase power supply so because of this you do not need to have a dual voltage motor for these to be able to power it, this is fantastic for applications like on the Bridgeport mill where the motor requires 415V and its not practical to replace the motor as its case is part of the head casting, these range from 1HP up to 20HP and there is a version with a 440V BI PHASE input as often found on farms that will power motors up to 50HP. These are the most basic type of phase converter unit and they have been around for years, they often take the form of a large and heavy blue box with a few switches and often a meter, this type of converter is in fact a very simple device, a typical unit will contain a 240V to 415V transformer, a relay switch connected to a bank of capacitors and some form of voltage sensor to control the relay switch, basically the 415V output from the transformer will become 2 of the output phases and the capacitors are placed between one of these phases and the third phase line to create the PHANTOM PHASE, how many capacitors are connected is controlled by the relay and also the power level selector switch, the relay will switch more capacitors in circuit to help get the motor started, it will disconnect them once the motor is up and running leaving just RUN capacitors in circuit, the power switch will then select how many RUN capacitors are left in circuit once this start boost has ended, the idea is to TUNE the converter to match the motor you are powering by selecting the number of RUN capacitors in the PHANTOM PHASE circuit, This is all well and good BUT there are a number of problems, its very hard to get the match of capacitors correct and a mismatched set-up will cause the motor to run rough, run hot and run with reduced power, even if you were to get the match the best theoretically possible the PHASE SHIFT of the PHANTOM PHASE can never be the 120 degrees it need to be as you would get on a true three phase system so you will always find the motor will be running down on power and often the running will be rough when compared to running on a true three phase supply, in precision machines like for example metalwork lathes this rough running can often be noticed in the quality of the work produced and people have often commented on this problem to me, The next problem that we have experienced is people burning out motors when using a STATIC type phase converter, you will notice that there will be a MINIMUM size motor listed on the specification of a typical STATIC converter, the bigger the MAXIMUM size of motor the converter can run the bigger the MINIMUM motor will be, as an example a 5½ HP STATIC will have a minimum load of ¾ HP, this is because of the size of the capacitors in the RUN circuit when the power switch is at the minimum setting, there would be too much capacitance in the system to run any motor less than ¾ HP, as often the suds pumps on a typical lathe or milling machine are often around the ¼ HP range if you try to run that motor on its own it would be far from happy as the PHANTOM phase would be being overrun and with time the motor would be burnt out, the solution here is to only run the SUDS PUMP when the MAIN MOTOR is running, you do need to be very careful about this, take for example the case of a lathe being run with the main motor on and the suds pump, because the main motor is larger than the suds pump you may have the converter power setting up to the level required for say a 3HP motor, if you were then to turn off your main motor BUT leave on your ¼ HP SUDS PUMP it would be subject to the PHANTOM PHASE power required for the 3 HP main motor as its life would be over in a very short time! Often because of the nature of the PHANTOM PHASE a STATIC CONVERTER can have a problem running some motor types, DUAL SPEED motors are one example as often one of the speeds on your motor will not run at all! Make what you will of these facts but if 24/7 operation is required again look at the DIGITAL PHASE CONVERTER, For small hobby applications on a tight budget the rotary converter may well be acceptable as the converter will often be at the lower end of the power range for converters so the constant power waste will be smaller AND its often not a problem for a hobby user to turn the converter off when its not in use and then switch it on again when they need to use one of the machines but constant switching on and off does put great strain on the starting circuits and so doing this may well reduce the units life expectancy, if you are going to do this switching on and off then the machine being powered from the converter will often be making more noise than the rotary's motor so this aspect of the rotary converters design will not be a problem. Rotary converters are NOT recommended for applications requiring 24 hours a day running. Still interested in a ROTARY CONVERTER? As we sell ROTARY PHASE CONVERTERS at the BEST PRICE ANYWHERE! We are also able to offer you a DIY KIT to make your own rotary phase converter. TECO EV 2HP 240V Single to 3 Phase Converter Inverter Waterproof/Dustproof IP65. 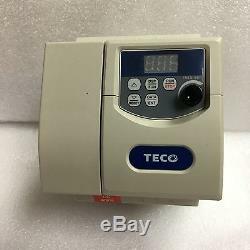 TECO EV 2HP 240V Single to 3 Phase Inverter Converter for Lathe Mill Drill SAW. TECO EV 3HP 240V Single to 3 Phase Converter Inverter Waterproof/Dustproof IP65. The item "TECO EV 3HP DIGITAL Single to 3 Phase Inverter for Lathe Milling Machine Saw etc" is in sale since Tuesday, August 1, 2017. This item is in the category "Business, Office & Industrial\Automation, Motors & Drives\Other Automation Equipment". The seller is "drives_direct_nottingham" and is located in GB. This item can be shipped to United Kingdom, Austria, Belgium, Bulgaria, Croatia, Cyprus, Czech republic, Denmark, Estonia, Finland, France, Germany, Greece, Hungary, Ireland, Italy, Latvia, Lithuania, Luxembourg, Malta, Netherlands, Poland, Portugal, Romania, Slovakia, Slovenia, Spain, Sweden, Australia, United States, Canada, Japan, New Zealand, China, Israel, Norway, Malaysia, Singapore, South Korea, Switzerland, Taiwan, Thailand, Chile.